Can Downtown Los Angeles Be Manhattanized? At a homeless shelter on Skid Row in Los Angeles, there's a man who once made a six-figure salary as a successful producer of Hollywood films and sitcoms. He produced a movie that grossed tens of millions at the box office, was represented by one of the largest television agencies and used to be friends with well-known actors. But then he had trouble getting work, and after a while was unable to pay rent. His family moved in with a friend, but then that house went into foreclosure. So four months ago, with nowhere else to turn, he arrived at the shelter with his wife and two boys. "I did everything I could not to end up in the stereotype of a shelter," says the producer, who asks not to be identified because he fears jeopardizing his chance of landing work. "I want out of here so bad I don't even want to engage in the culture. I don't want to be comfortable because I'm not." The man and his family are doing everything they can to maintain a sense of pride, and they are trying desperately to hold onto their former lives. Their 8-year-old son spends four hours on a public bus everyday so he can keep attending school in his former neighborhood. His mother proudly exhibits his honor-roll certificates and gives examples of how smart he is. When the father does get hired for lesser work on films, he'll ask people to pick him up at a nearby loft residence so he doesn't have to disclose he's homeless. For months, his wife avoided contact with a shelter worker she had met years ago because she didn't want the staff member to know she was homeless. "You're used to having, and you downsize and you downsize. What do you do when you have nothing left?" says the wife, who used to work as a nurse's assistant. "The hardest part is, How do you maintain your daily life and keep things intact for the kids and your own sanity, and at the same time move forward?" Homelessness is not a new phenomenon in California. What is new  and so alarming  is that more and more of the homeless are families that once believed they were secure members of the middle class. 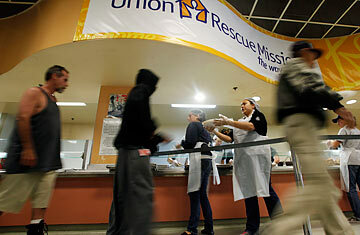 The number of families hosted by this Los Angeles shelter, called the Union Rescue Mission, has tripled since the economic crisis began in 2008 and has hit a record high of more than 60 in recent weeks. The growing trend is a sign that the nationwide economic slump is having a brutal impact on poverty in states that have high unemployment rates like California, and that a feared second recession could push the poor there over the edge and make a solid recovery even harder. More than two years into the economic recovery, there isn't yet a light at the end of the tunnel for California's economy and stubborn unemployment. The number of job losses in the state is still much higher than the worst moments of the 2001 and 1990 recessions, according to calculations by Sylvia Allegretto, an economist at the Institute for Research on Labor and Employment at the University of California, Berkeley. The state's jobless rate hit 12% last month, the second worst in the nation. A broader measure of unemployment  which also includes part-time workers and people outside the labor force who have been looking for a job  is 22% in California and 24% in Los Angeles, while the national average is only 16.5%, according to the Bureau of Labor Statistics. The impact on children has been brutal: since 2007, 7% of the state's children have had a foreclosure process started on their homes, the fourth-highest level in the nation, according to a study released this month by the Annie E. Casey Foundation. And families can rely less on welfare because state and federal budget crises have cut social services. Allegretto calls it "stunning" that despite the dismal outlook for the poor, leaders in Washington and Sacramento have invested more time debating the debt ceiling and the budget deficit, respectively, than trying to help the unemployed get back to work. "All these things are only going to get worse because there's nothing in the short-term plan that alleviates these problems," Allegretto says. "It's really devastating." The word devastating is an understatement on Skid Row. Walk out the front door of the Union Rescue Mission, and it becomes evident why families make this an absolute last resort. The shelter sits in an area lined with people subsisting in tents, living out of shopping carts or suitcases, or just plain sleeping on concrete. Some of them smoke crack, some are in wheelchairs, some are mentally ill, and others are just trying to survive without a job or a home. It smells terrible since some people relieve themselves on the street for lack of a better place. For safety reasons, shelter workers advise visitors not to walk alone on the streets, even in broad daylight. Inside the shelter walls, when the Union Rescue Mission CEO, the Rev. Andy Bales, answers the phone and someone asks how he's doing, he often starts off with a customary "I'm hangin' in there." After further inquiry, he replies in a low, battered tone, "It's kind of wearing me out." The shelter is faced with decreased funding from private donors, salary cuts for staff and declining morale about how long it will be able to continue helping people. And now, there's the threat of a second recession. "It's terrifying. It's been keeping me up at night the last few days," Bales says. "I've been thinking, 'Here we go again. How are we going to weather this?'" Meanwhile, the shelter is at "more than overcapacity," he says, as people sleep in tents on wheels inside the building because there are no more beds. More than half of the families at the shelter lost their homes in the housing crisis. "That's the big change. These are people who are experiencing homelessness for the first time," Bales says. Marqueta Bourgeois is another case in point. Only a few months ago, Bourgeois, 34, worked in Bank of America's home-collections department; her job was to let customers know they were late on their mortgage payments. Meanwhile, she was falling behind on her own payments for rent, and soon she was fired after taking too many sick days. When her only monthly income became a $286 welfare check, she and her family were forced out of their apartment and then quickly wore out their welcome staying at friends' houses. "I felt like everybody was against me," she remembers. "I was getting depressed, thinking, How are we going to make it?" Bourgeois' eyes well up with tears when she recounts how she, her mother and her 7-year-old son slept in Los Angeles' Union Station and in emergency rooms when they had nowhere else to turn. They've now lived for the past two weeks at the Union Rescue Mission. "I've always had a good house. We always had a nice car. My mom worked for the county, and we were able to wear nice things," she says. Now "my friends judge me. They say, 'How could you take your child down there?'" Some, like Bourgeois  who is planning a transfer to transitional housing  will make their way out of homelessness. But if the economy remains as it is, many people might not. See photos and portraits of Los Angeles. See pictures of the world's greatest cities.